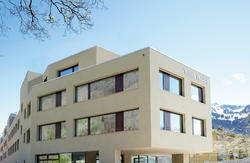 Balmers Hostel is the first private hostel in Switzerland, with over 60 years of business experience. Itâ€™s a real home-away-from-home for travelers from all around the world! 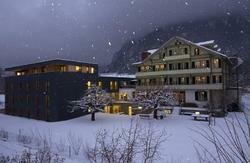 We continue to provide provided excellent service and accommodation for both individuals and groups. Proud members of one of Europe's Famous Hostels, due to our exceptionally clean rooms, low prices and variety of facilities which include a guest kitchen, hot tub in the garden, hammock chill room, games room with pool, table tennis, fireplace room and much more! 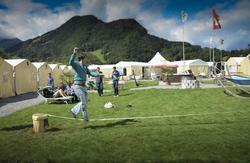 In the summer months visit our Backpackers Tented Village only 800m away, where we take camping to a new communal level! It has a seven-person hot tub and a small swimming pool. We offer human Bubble ball games, relax in a hammock whilst sipping an ice cold beer surrounded by mountain views!! As the sun disappears, make your way to our bar where you can socialize before a night of partying in our club. 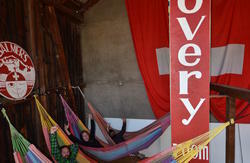 With friendly and knowledgeable staff, we continue to give travelers everything they would want in a hostel and more. The following activities can be booked at Balmer's at the best prices: snowboarding, skiing, sky-diving and sledding during the winter and sky-diving, canyoning, rock-climbing, mountain biking, paragliding, rafting in the summer. Enquire about our packages! Guests from all over the world come to enjoy our hospitality and comfortable atmosphere. Come join us at Balmers - your home away from home. Check in from 14 noon and check out is at 10.00am. Please note all linen are inclusive so no need to bring your own sleeping bag and extra blankets are provided for chilly nights . We are situated a short 15-minute walk from either train station, however, Taxis are also available as well as public buses from both stations. Number 105 and 104 will both bring you to the hostel in no time at all! Straight out of station, between the bank and the shopping centre, straight through two traffic circles, and follow brown signs to Balmer's.